It’s been a busy few weeks but the intention HAD been there to do an Oscars prediction post. Good old Matt had inspired me in his own inimitable way to take in the films and, with the exception of THE CURIOUS CASE OF BENJAMIN BUTTON (and THE READER…. hmmm), I’d managed to see the top contenders for the main awards in good enough time to make a set of, maybe not predictions, but bold claims on who should win. So here we go, who won and who (I think) should have won…….. I didn’t do incredibly well in terms of agreeing with the academy. I’ll only cover the big 6 or I’ll be here all night…. Now I’m gonna be honest here. I knew SM would get the nod. It’s a very well made, entertaining, beautifully shot, acted and directed work from Danny Boyle. I have to say though, and I can say this with confidence even though I’ve not seen THE READER, FROST / NIXON was the picture from the bunch that had me absolutely transfixed from start to finish. Whether that was purely because of the extremely interesting, non fiction subject matter or not, the fact remains, it moved and consumed me in a way SLUMDOG couldn’t. “This was undoubtedly the shock of the night” said numerous red carpet commentators and I think, as most people probably do, that Mickey Rourke was robbed. That’s not to take anything away from Sean Penn, he’s by far the best thing about the MILK film and you totally forget you’re watching him act. Mickey Rourke however, gives a depth of performance that maybe only comes along once a decade far less once a year. You could tell there was a lot of himself in that role which lent such honest weight to it without it being a case of pitying the guy. We’re with him for the whole picture, when you witness him dragging his battered body into the ring for another pounding you can almost feel the pain he’s going through. And let’s not forget the Rourke of circa RUMBLEFISH. I had Meryl Streep for this one and my reasons are irrefutable. Firstly: Streep is amazing in this film. Secondly: It was the only movie in this category I saw so who else was there to choose? CHANGELING was the only other picture I would pay to watch from this group. Film critic Mark Kermode thinks that Winslet deserves the award, just not for this film, in his opinion she should have got it for REVOLUTIONARY ROAD, another movie I’ve yet to see. Does anyone concur with this take? It was always going to be the case and I agree with it completely. There’s no way on earth this is purely a sympathy vote. Philip Seymour Hoffman is great, Josh Brolin is good but I think if anyone from MILK got nominated it should have been Emile Hirsch for his utterly convincing and compelling performance as Cleve Jones. Heath Ledger, however, creates this heaving, magnetic, mesmerising character you can’t take your eyes off. When The Joker leaves the screen, you want him back as quickly as possible, you want to see more disapearing pencils, he’s the bad guy you fell good routing for. Ledger completely abandons himself in this role and leaves you with a dark presence long after the credits have ended. Truly amazing and thoroughly deserved. My initial thought when I heard the results was that Marisa Tomei should have got this for her role as Cassidy in THE WRESTLER. I revisited VCB last night though and now agree with our friends at the Academy. Penelope Cruz is rather good isn’t she? I was going to do a Cruz double by sticking on VOLVER after it but then I would run the risk of starting to like the woman. It’s a compulsion I’m determined to fight for no good reason. Yep, you’ve gotta hand him this one without any real complaint. There were other movies in the Best Picture category that held my attention more the SM but the sheer audacity, energy and skill with which this film was made should be applauded long and loud. I’m a big fan of Danny Boyle, as a director he’s always pushing the envelope and never takes the easy route. There is a sincerity in his films that clearly reflect the man himself, he’s one of these guys that when you hear them talking about cinema, you know they mean it from the heart and you can’t help but take serious notice. Scorsese is another one. Well done Danny. Here’s hoping the British film industry realises finally that it’s not America’s runt brother. And who said it was only high-brow French cinema that gets a nod on this blog. Shame on you!….. So winter has hit Scotland after the four weeks of slightly warmer rain we like to call summer. This is traditionally a time for mass movie going for Lauren and I as there’s precious little else to do indoors in Edinburgh that generates any real fun, there is only so many times you can walk round that damn castle. 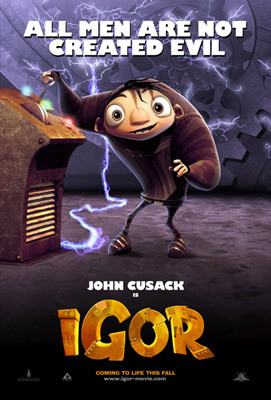 Last weekend we took in the new animation feature IGOR, which features the voices (because it’s all about the voices) of John Cusack, Steve Buscemi, Eddie Izzard, Jennifer Coolidge, John Cleese and Jay Leno, amongst others. I have to say, I found this to be a nice little movie. British film critic Mark Kermode said it’s “a Tim Burton movie with all the Tim Burton bits removed” and while I can kind of see where he’s coming from, I think there’s enough in this film for it to stand on its own two feet, albeit just. 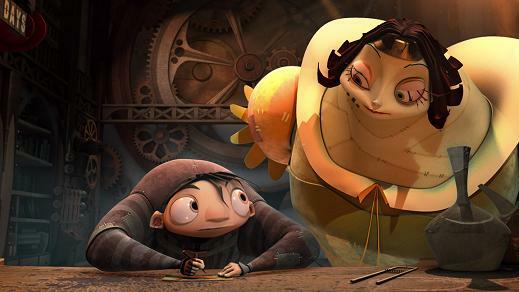 The film, like most contemporary mainstream animation, attempts to work on two levels by providing engaging material for both kids and their long suffering parents. The movie delivers some nice slapstick in the form of Scamper the suicidal rabbit who is voiced by the perfectly cast Steve Buscemi, there’s just something wonderfully defeatist about Buscemi’s delivery which works to great effect in this film. The nice touch here is that the rabbit is not actually suicidal but is just tired of living after being made immortal by the brilliant but totally ignored Igor, voiced by John Cusack. The third character in the trio of friends is brain that is simply a brain in a jar but ironically, is thick as mince in the neck of a milk bottle. 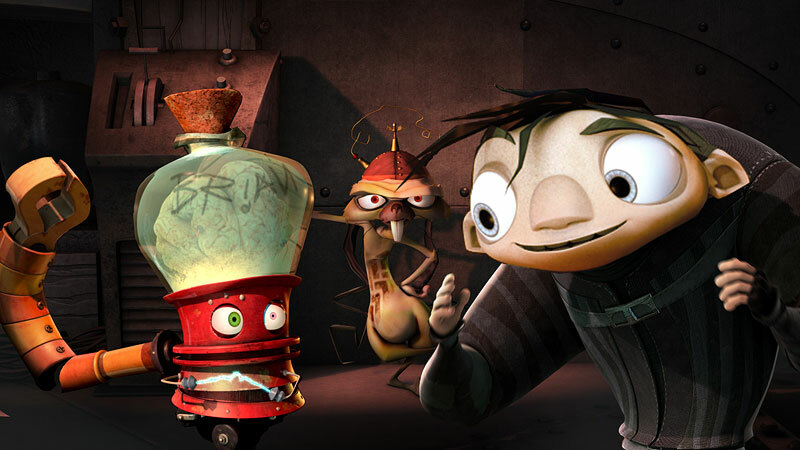 Brain, like scamper, is the result of Igor’s inventive, but hidden talents. 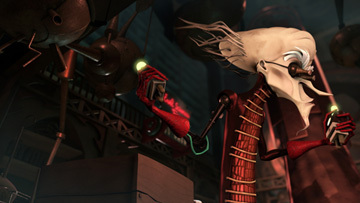 The film is based in the fictional city of Malaria and follows Igor’s quest to prove to the world how clever he is by winning the annual science fair, this has been tough due to the fact that Igors are expected only to be bumbling servants to the ego maniac scientists that litter the city. It could be said that the Igor’s are held back because of the way they look, talent means nothing as long as you have an ego and beauty, very fitting when considering this alongside our X Factor obsessed society. Igor’s master is voiced by John Cleese and for me is the best drawn character in the picture, of course it’s this aesthetic that leads to the Tim Burton comparisons but I like it all the same. On seeing his master blown up by his own stupidity, Igor seizes the chance to enter an invention, dressed as the work of his dismantled oppressor. Great hilarity ensues as Igor creates a Frankenstein woman who instead of being evil, is programmed to act like an actress. There’s a bit of a twist at the end that again, is more aimed at adults and goes as far as saying the government is corrupt and creating a smokescreen that leads to the population having a fear of what isn’t really there…… Sound familiar? This message isn’t too subtle either which led me to like the movie even more. Not that this is a great film, it’s only just reaching good, not a bad way to spend some time with your kids on a horrible Scottish afternoon however. What REALLY gets on my nerves now is how little choice there is for kids under 12 these days. Back in the golden age of “the code” kids could pretty much go and see anything. You’re lucky if there’s 2 features specifically for kids at any one time in mutiplexes these days, and those are usually advertising vehicles for merchandise, this begs the question, where can modern children develop a love for cinema? If their parents aren’t pumping them full of old Marx Brothers, Preston Struges and Ernst Lubistch pictures, they’ve no real grasp of how wonderful the cinema can be…… I despair.